If your space is full of bulky gadgets that you almost never use, declutter by DIYing a simple, smaller version of this meal prep must-have. Single-use kitchen gadgets—garlic presses, juicers, and vegetable peelers—all do their jobs exceedingly well, but even a small collection quickly clutters drawers, counters, and cabinets. Each additional helper eats up space, especially if you’re not using them for a month or more at a time. Still, the guilt of trashing tools you’ve spent good money on keeps them around. For zero regrets and a decluttered kitchen, donate your underused gadgets today, then follow the lead of DIY-er ShakeTheFuture to craft this disposable (and totally free!) vegetable peeler. His process, which he demoed for the camera, is simple: Start with a clean soda can. Wiggle the tab back and forth until it falls off, and then lop off the top with scissors or a can opener. Once the metal flap is removed and the thin rim bent, the inside edge of the hole (once used for drinking) can be used for quick, angled cuts—perfect for skinning potatoes, carrots, apples, and more. Even though the peeler is free to make, you don’t have to be broke to see the beauty in this simple DIY. Minimalists will approve of the peeler’s stainless steel design and slim profile, and campers will love whipping up dinner with a convenience that’s normally reserved for home-cooked meals. At about 1/3 the size of traditional peelers, it saves space in a storage-starved kitchen without sacrificing functionality—an a-peel-ing idea for every renter or homeowner. 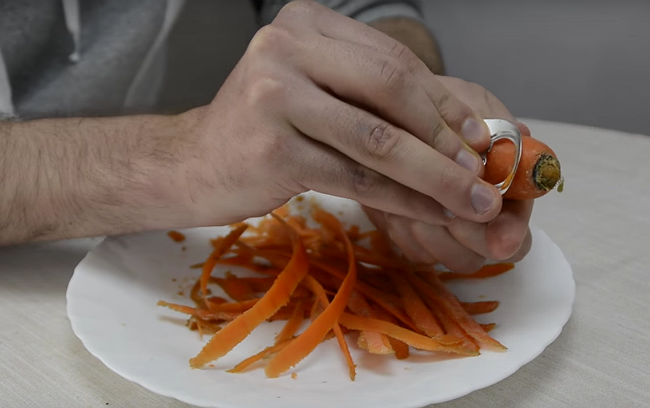 And if your DIY peeler is so small that you’re afraid you’ll lose it, go ahead and toss it after dinner! You can remake it in minutes with a clean soda can and a pair of scissors.